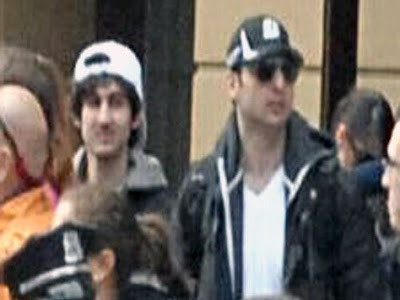 The Boston Police in a measure breakthrough have announced that they have identified the perpetrators of the Boston Marathon bombings. At night on Thursday, one of the suspects was shot dead by the the Boston Police in a encounter. Exactly after less than seven hours after the FBI releases images of Boston bombing suspects, one is killed in a shootout with police, the other remains the target of a massive manhunt. The manhunt has already began and the whole area of Massachusetts has been shut down along with the rail and bus transport. The businesses, schools and colleges have been asked to be closed till the suspect Dzhokhar Tsarnaev, 19 has been apprehended. Earlier the elder brother of Dzkhokar, Tamerlan Tsarnev was shot dead by the Police officers in a encounter in which a Police officer, Sean Collier lost his life and another Police officer is in a critical condition. The Police gave a hot pursuit at 10:30 p.m., when the two men robbed a 7-Eleven convenience store on the MIT campus in Cambridge. The suspects later carjacked a Mercedes SUV in Cambridge, holding the driver at gunpoint for a half hour before he was released unharmed, according to the Middlesex district attorney's office. Police found the car and the suspects in Watertown, and pursued them into a residential neighborhood where gunfire was exchanged in which Tamerlan was shot dead. Meanwhile Police have informed that the Tsarnev brothers had come from Dagestan in Russia as refugees to make their living in USA. Tamerlan was studying engineering at Bunker Hill Community College in nearby Charlestown while the fugitive, Dzhokhar Tsarnaev was a wrestler at the Cambridge Rindge and Latin School in Cambridge, Mass. He was named a Greater Boston League Winter All Star in 2011. Dzhokhar Tsarnaev is the person whom the FBI believe to have dropped the explosive laden back pack which caused the second explosion and the Police say there may have been additional people involved in the Boston Marathon bombings. Hope they get Dzhokhar Tsarnaev before any for innocent blood is spilled. Please click here to read my articles on world affairs. Please post in your comments on this article.